Uncollared Mountain Lion in the Eastern Santa Monica Mountains, captured on one of CLAW’s Nature Cams. Mountain lions are elusive animals that tend to avoid humans. Encounters with mountain lions are rare, and no fatal attacks by mountain lions have ever been recorded in Los Angeles County. However, just as with any potentially dangerous wildlife, caution should always be taken in mountain lion habitat, particularly with small children and pets. 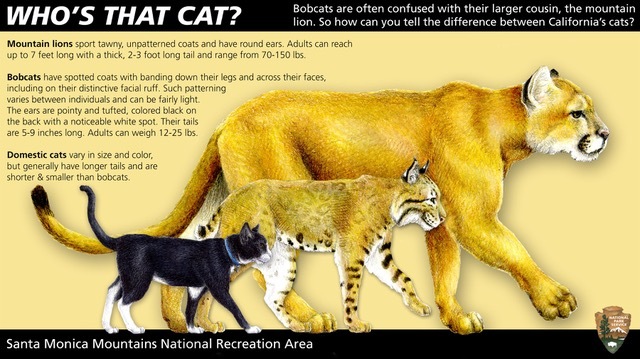 Many mountain lion sightings turn out to be bobcats, house cats, or even dogs. Some key characteristics of mountain lions are their large size, long and low tail, and uniform brown coloring, with black on the tip of the tail and around the muzzle. Mountain lion kittens have spotted coats and bright, blue eyes. If you live in an area that is known to be inhabited by mountain lions, never leave your pets or small children outside unattended. When walking dogs, keep them on a 6 foot leash at all times. If you have livestock, make sure they are securely enclosed at night. Mountain Lion Foundation has created a guide to building a low-cost, predator-proof enclosure, which you can view here. Installing outdoor motion sensor lights will help deter mountain lions as well as make it more difficult for a mountain lion to approach unseen. If you encounter a mountain lion, remember these CLAW steps to take! Children or pets should be picked up. Leave space for the mountain lion and do not approach. Appear as big and loud as possible. Walk away slowly. Do not run. In the rare event that you are attacked, fight back. A mountain lion sighting is not necessarily an emergency. If you feel that there is a safety emergency, you can call the LA Animal Services Emergency Line at 888-452-7381. If there is no answer, leave a message (average callback time is under 5 minutes).